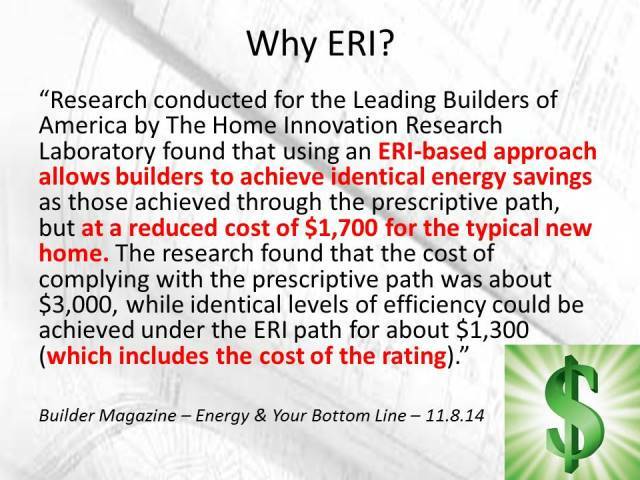 Needless to say, there is one major outspoken critic who is busy pushing for the ERI option to be dropped and essentially blasting it all together and doing his best to discredit it. During one of the residential sub-committee meetings he was able to push for it to be dropped (4 – 1) and that is being voted on by the full committee tomorrow afternoon. Many of us are banding together to help dispel many of the notions (“perception is reality”) being bandied about and trying to get it reinstated. If you would like to add your name to this effort and allow the market to decide the best path, please go to iPetition & add your name. Interestingly there is a who will QA this, make sure it is done properly argument / no two HERS ratings are the same. Granted this is an issue RESNET is dealing with head on as there are a few bad apples out there and occasionally some confusion among some. 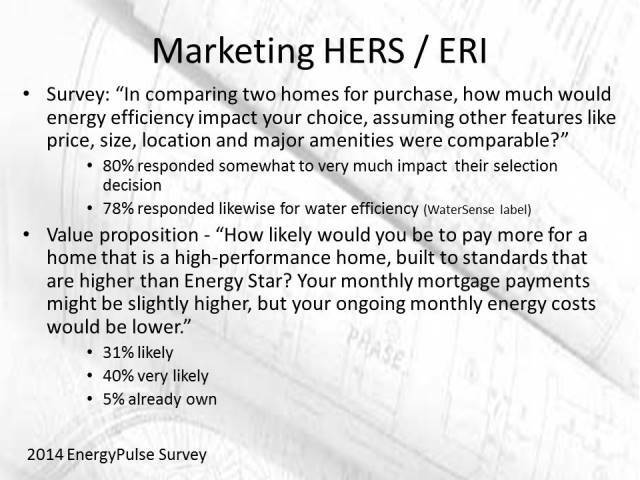 The biggest problem area for no two ratings / confusion is actually for existing homes. As a rater we undergo a stringent QA process already with not only our QA provider having to check numerous files throughout the year, but also doing a set amount of field ratings. 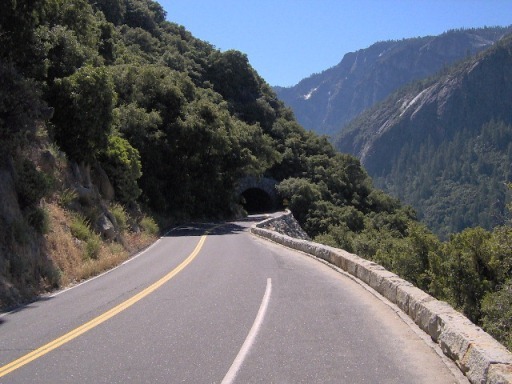 They also are required to make sure that every rater has there equipment calibrated each year. There just isn’t enough…. well I know personally of at least 30 RESNET raters in the state. Just using those numbers, if you consider each rater doing 1 rating a day, 4 days a week, with two weeks off for vacation (easily doable number especially as I know some averaging 2 a day) you would come up to 6000 total ratings which is more than there are housing/town home starts being permitted in this state. 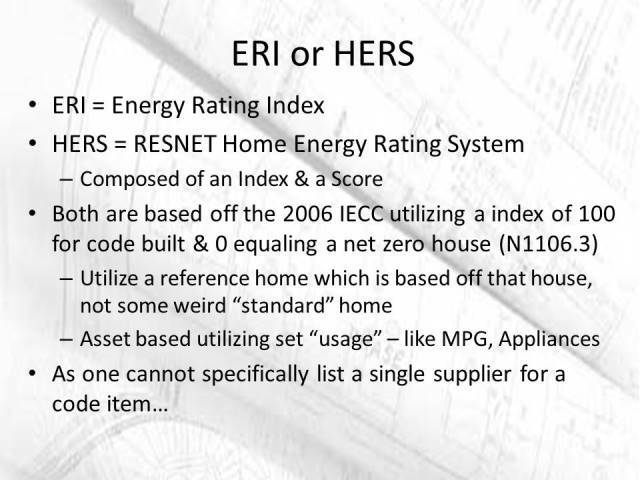 Hmmm this almost seems like another wording based off of #1 but lets look at it another way – the HERS scoring system is the biggest certification group in the nation (based on buildings certified.) Last year there were over 146,000 homes rated in the US with Illinois completing 1721 of them with an average 59 for a rating. 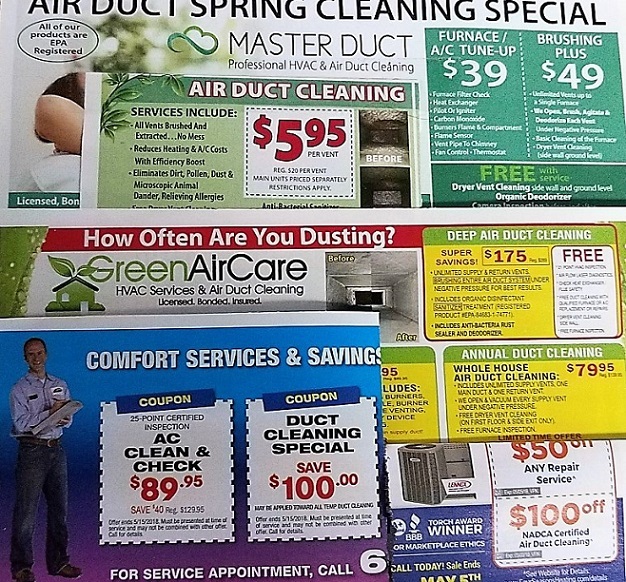 DOE, the EPA, and the IRS use this system as a requirement for many items like certification & tax breaks. 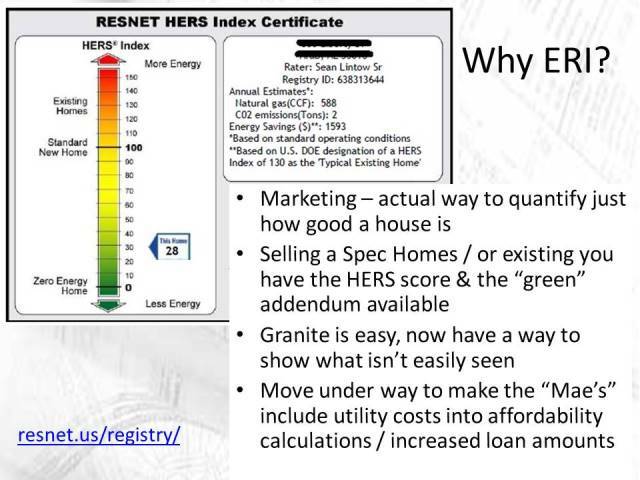 Numerous other “green building” programs like LEED use this system to help validate and certify homes. Many RESNET standards & protocols are now an ANSI standard which also means that the playing field is open for similar organizations to adopt if they see fit. 4. Ability of code officials and builders to understand its application. Seriously? 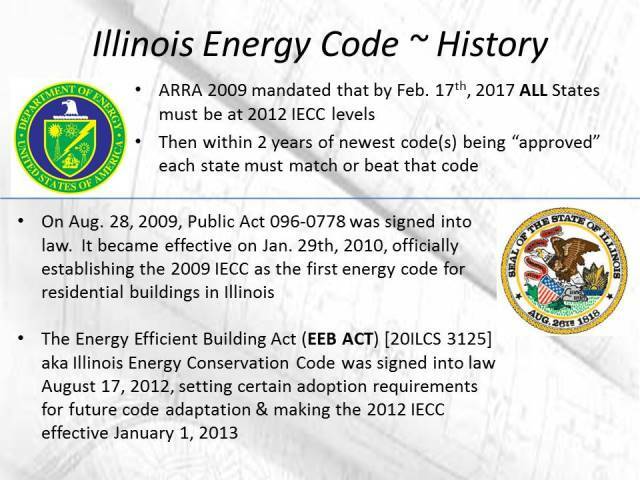 A house must either have a HERS score of 54 or 55 (depending on your climate zone in IL) and meet the 2009 insulation levels. There is one simple report that states that yes they meet it or don’t. That has got to be a lot easier than trying to make sure the ResCheck report was done properly (and someone is making a ton of money on as the State’s consultant). 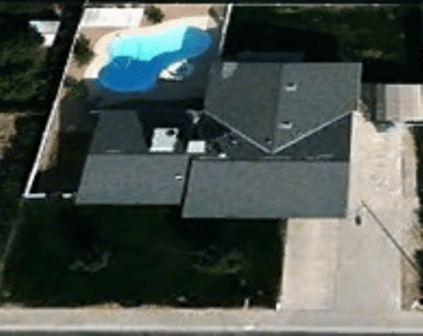 Want to dig into a house a little more deeply? 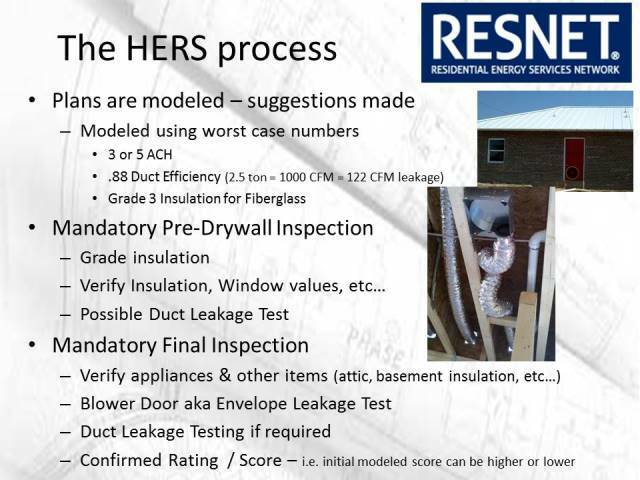 There is a report that shows every detail of the structure including anticipated air & duct tightness levels that are to be met. These reports, are not possible without them being signed off by there QA provider. The other falsity of this statement is how many code departments already not only accept these locally but use them for their stretch code programs like Massachusetts and others. 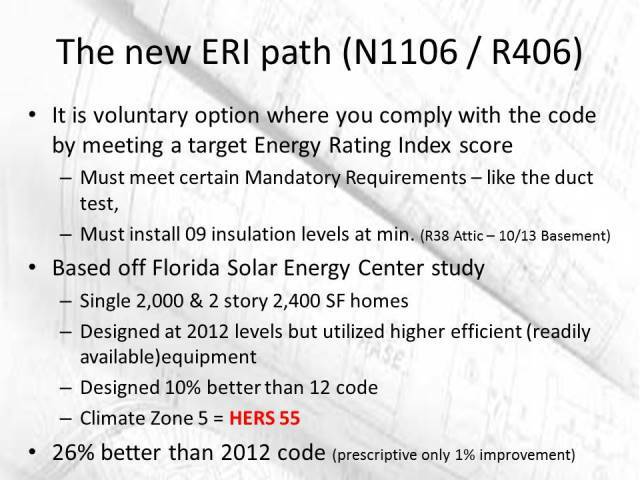 In many ways this makes the code officials life easier especially as they can even look the HERS score up online if needed. Hmm this tends to make me believe that the HBAI reps somehow missed this meeting… With that said they have stated that they have no interest in loosening it up and even if they did it is a fair discussion (only one state has loosened there’s up which was a local issue as even the HBA doesn’t even list this as a talking point.) The only two items I know they are fighting is the ACH number & the sealed combustion closets. 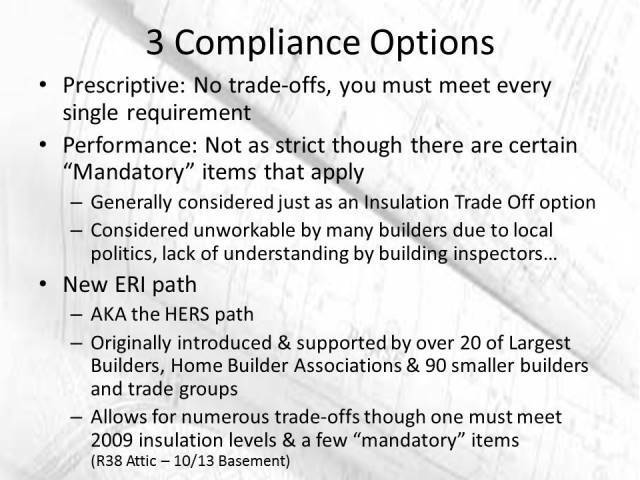 Once again we would encourage you (whether a rater or builder) to add your name to this iPetition effort as subtracting compliance options benefits no one and to allow the market to decide the best path. 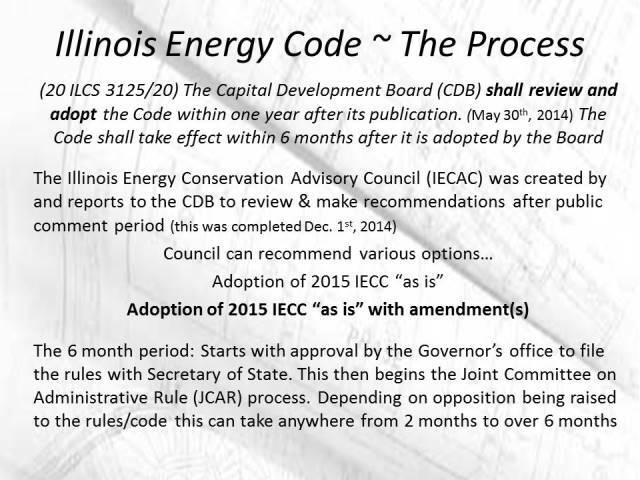 Energy Code Basics: FAQ - State Wide Code Apply Locally?